Care to sit down for two seconds? I just realized the other posts on my blog are all about sports. But, it’s also about starting off in the ICU. For of those of you that don’t know, an intensive care unit is a unit were acutely ill patients go for care. They are the real sick ones who have either had cardiac arrests before, or will have one on the unit, or have so many differing issues relating to various organs which seem to be going into failure. The population I work with is mostly in their 70’s and above. Occasionally I’ve seen patients who are in their 30’s, and rarely in their 20’s. I must admit it can be slighly….ehh….uncomfotable taking care of someone the same age as you, who has gone into multiple system failure, vented and trached, PEG tube in place, and having multiple other issues. It definitely puts life into perspective. 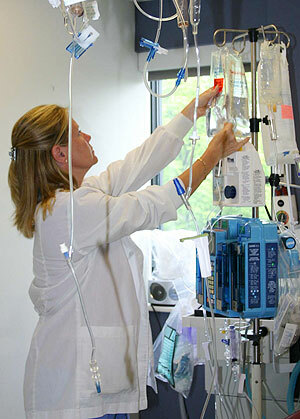 Many of the patients are on various fluids and electrolyte replacement, and continuous medication infusions which you monitor like a hawk because we titrate the medication according to certain responses we want. For example if a person has too high of a blood pressure, we start him on a nitroglycerine drip and in small increments, increase the dosing as it correlates with the person’s blood pressure. And increase in nitroglycerine should decrease blood pressure. I have 2-3 patient assignment loads, which is a lot for the nurse-patient ration (which should technically be staff ratio of 1:2 But with the lack of appropriate staffing, it seems that the number of patients each nurse accepts is on the rise, which I feel is dangerous. Every person on the unit is in critical condition, and being short-staffed increases risks of errors. I had a two patient assignment, one was vented and had a new tracheostomy and going to get a PEG placement next week (a PEG tube goes straight into the stomach, instead of a nasogastric tube, that goes in down through the nasal cavity, down the esophagus, and into the stomach.) And the other had blood pressure issues, so I had to closely monitor the vasopressor drip he was on. His lab values and electrolytes were all out of whack, so we were constantly replacing him with more electrolyte solutions, redrawing labs to see how the replacements had helped him, and keeping him sedated. Furthermore, he had horrible weeping skin tears, so I was changing his dressings every couple hours. Aie. He was a mess. Our shift starts at 0700 in the morning, and supposed to end by 1930. But it’s rare to leave before 8. And yesterday, with all the new issues popping up with my one gentleman, and my other new post-op trach patient becomming increasingly aggitated, I don’t think I sat down for more than 5 minutes the whole shift (and those 5 minutes were scarfing down my lunch). Who has time to sit when you’re in and out of patients rooms, checking them every five to fifteen minutes, re-assessing, changing their positioning, and titrating drips which are hanging? That’s why a good pair of shoes is vital.